The diamond in a square is a unique lace pattern use to make delicate items, such as table clothes, shawls, dollies and blankets. Usually, these items are made with a cotton or linen thread. However, this pattern can also be used to make a lace pattern placemat as well. Crocheting the placemats requires a thicker yarn to give it a stronger texture and weight. For instance, a 4 ply 100% acrylic worsted weigh yarn will work better for your placemats. This pattern is crocheted in multiples of 8 stitches + 1 to complete the diamond in a square design. For example, if you want to repeat the pattern 10 times, 10 repeats x 7 stitches will give you 70 stitches. Then add 70 + 1 to give you the total number of 71 stitches to begin your any project that requires diamond in a square. Asterisks * are denoted for a repeat of a row or a repeat of several rows. Chain 10 counts as chain 3 turning chain and chain 7 turning chain. Foundation row: with a crochet hook size H/6 (4.25mm) and yarn 7ounces. Chain 32 + 1. With your crochet hook and yarn chain 10. Insert the hook in the 15th chain from hook and make a slip stitch, * turn and chain 2, double crochet in the next chain of the chain -7 stitch—7 times, turn and chain 2. 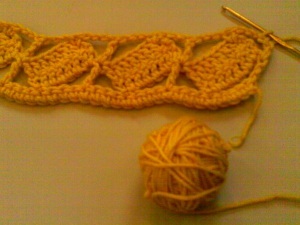 You want to skip the first double crochet stitch (dc). Then make a dc in dc – 6 times, work a dc in the top of the chain- 2, skip three of the base chains and make a double treble crochet (dtr) in next stitch, skip three of the base chains, chain 7 then slip stitch in the next chain of the base chain* repeat from one * to the other * ending with a dtr in the last stitch. Row one completed. Turn your garment and chain 6. * work a single crochet (sc) between the chain-2 and dc at the top of the diamond made the in previous row, chain 3, work dtr in dtr then chain 3 * repeat from * to * across the row ending with a dtr in the turning chain (tch). Row 2 completed. Turn garment then ch 3. Skip the dtr and the ch 3, * ch 7 then slip stitch in sc and ch 2. Work a dc in each of the next 7 dc. Turn ch 2, skip first dc, work one dc in each of the next 6 dc and in the top of the ch-2 space, skip the next 3 chs, work a dtr in dtr and skip the next 3 chs then repeat from * to * across the row ending with a dtr in the last ch. Row 3 completed. Repeat rows 2 and 3 until your placemats have 8 rows of diamond across the bottom edge and 4 diamonds on the side edge of your placemat. The number of total diamonds in a square --32. Work a sc in each stitch around all of the edges of your placemat. Fasten off.